Baylyblog has a 2008 post on the issue of whether the morning-after pill is okay even if RU-486 is not. The difference is that the morning-after pill (like birth control pills, but with higher probability, since birth control pills mainly prevent fertilization) prevents implantation, whereas RU-486 causes the fetus to detach from the uterus. The post quotes Jerry Frederick, a Bloomington pharmacist, who will sell the morning-after pill but not RU-486. Around 1990, people were afraid of “crack babies”: that babies born to mothers smoking crack would be seriously damaged. This might be worth looking at now because it might (I’m not sure) be another case, like Y2K, of a scare caused by experts who supposedly were a scientific consensus– like global warming. This 1995 MOther Jones article talks a bit about it. Seizing on early studies that raised alarm over fetal damage from cocaine, scientists cited the same inconclusive data again and again. Local news organs spun their own versions of the crack-baby story, taking for granted the accuracy of its premise. Social workers, foster parents, doctors, teachers, and journalists put forward unsettling anecdotes about the “crack babies” they had seen, all participating in a sleight of hand so elegant in its simplicity that they fooled even themselves. The earliest and most influential reports of cocaine damage in babies came from the Chicago drug treatment clinic of pediatrician Ira Chasnoff. His first study, published in 1985 in The New England Journal of Medicine, found that the newborns of 23 cocaine-using women were less interactive and moodier than non-cocaine-exposed babies. In the years that followed, Chasnoff was widely quoted and fawned over in the press (“positively zenlike,” according to Rolling Stone) and became known as the rather pessimistic authority on what happens to babies whose mothers use cocaine. In the past couple of years “daylight” light bulbs have started to be generally sold. These are bulbs which have less yellow light and thus are closer to daylight. 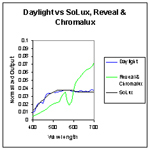 The Solux company website persuasively and toughly claims that its competitors all do a bad job of replicating sunlight, as the diagram here shows. If they are being truthful, their own $8 bulb is far better, though it needs a two-prong, non-standard fixture. I wonder whether any normal-fixture bulbs are better than the Reveal brand? With regard to neurological diseases, a large body of evidence suggests that the risks of Parkinson’s disease or Alzheimer’s disease might be twice as high for non-smokers than for smokers. Many such papers regarding Alzheimer’s disease and Parkinson’s Disease have been published.